Humphrey Bogart and Ingrid Bergman may have given the world Casablanca, but there is much more to see in Morocco than its largest city. This former French colony gives travelers the opportunity to experience life in an ancient Arabic and Berber culture, sunning on beaches or snow skiing in the High Atlas. 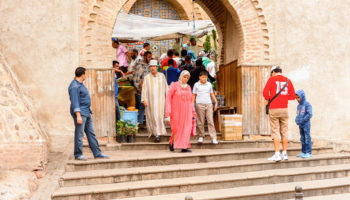 Get lost in the local life of the meandering medinas of Marrakesh, rock the kasbahs and follow in the footsteps of ancient traders in Fez, while Casablanca offers up a more modern mindset mixed in with its heritage. Chances to leave the cities behind are in abundance, as the sweeping Saharan desert seduces visitors, while Atlantic beach destinations create the perfect spot for kitesurfing enthusiasts. Sidi Ifni is a small fishing town of about 20,000 inhabitants that is located on the Atlantic coast of southwest Morocco. It is a former Spanish territory that still retains that heritage. Sidi Ifni is popular with surfers. Temperatures average 22°C/71°F year round, making any time a good time to visit; it is a haven for Europeans seeking respite from cold winters to the north. Sidi Ifni is bigger on atmosphere than on things to do, but it does have a lively fish market as well as a Sunday market at the old airfield. Rabat, located on the Moroccan coast, is the country’s capital and a top tourist destination – CNN named it one of the top travel destinations of 2013. The new portion of the city is pleasant, with wide boulevards and outdoor cafes. 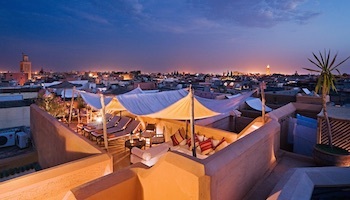 Most travelers will gravitate to the old town, or medina, with its fortified walls. Here, they can shop for carpets and leather, while soaking in the atmosphere of another culture. Also worth seeing is the Kasbah des Oudaias that sits on a bluff overlooking the ocean. Meknes is one of the four Imperial cities of Morocco and its name and fame are closely linked to that of Sultan Moulay Ismail. The sultan turned Meknes into an impressive city in Spanish-Moorish style, surrounded by high walls with great gates. 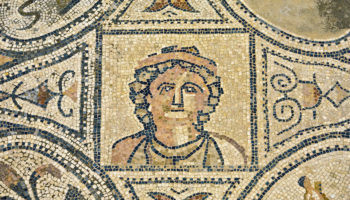 While Meknes is an imperial city with a lot of historical monuments and natural sites it is also the nearest city to the Roman ruins of Volubilis. 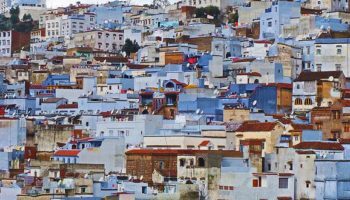 Chefchaouen might just as well be called the blue city because it’s filled with – what else? – buildings in various shades of blue. 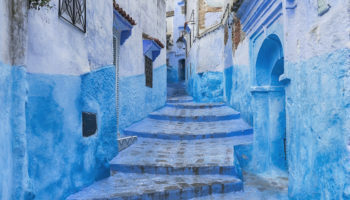 Located in northwest Morocco, Chefchaouen is close to Tangier, making it a popular tourist destination. 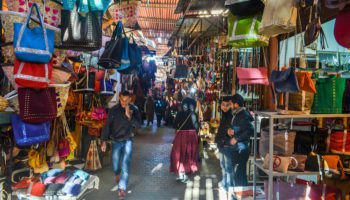 It’s popular with shoppers who can find Moroccan handicrafts, such as woven blankets, not found elsewhere in the country. Goat cheese also is popular, but most likely doesn’t top the popularity of kief, a part of the cannabis plant, that is openly sold in shops. Now a popular seaside resort town, Asilah has a glorious history that dates back to when it was a trade center for the Phoenicians in 1500 BC. In the 19th and 20th centuries, pirates used it as a base of operations. Fortifications from these bygone eras remain, surrounding the restored medina. Asilah is located on Morocco’s north coast about 30 km (20 miles) from Tangier. 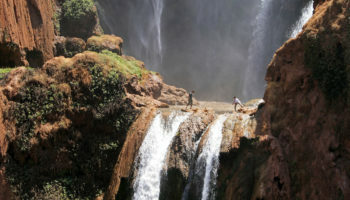 It’s a hot summer spot for Moroccans; travelers who want to avoid crowds had best visit in spring or fall. Whitewashed buildings complete the picturesque scene. It has a good selection of budget hotels and restaurants, and a growing art scene. 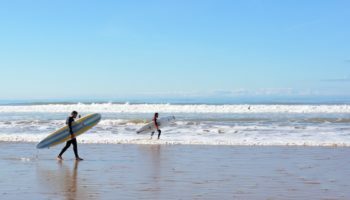 About 2.5 km (1.5 miles) south of Asilah lies Paradise beach, a wonderful wide stretch of sand, popular with locals and tourists. 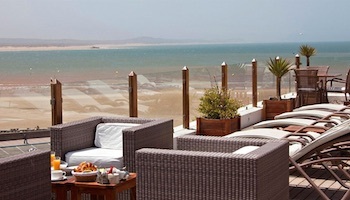 Situated on Morocco’s Atlantic coastline, Essaouira is one of the nation’s most popular beach destinations. White-washed homes sporting cobalt blue shutters provide a scenic backdrop for breezy seaside adventures, which include kitesurfing and windsurfing. The city’s medina features crafts made using centuries-old techniques, including thuya wood carving and cabinet making. Essaouira, formerly called Mogador, is a natural port. It’s been prized as such since the 1st century, when the protected bay provided anchorage for Romans trading for the purpura shells. Fes, or Fez, is a former capital of Morocco that is now the country’s third largest city. Home to University of Al-Karaouine, the world’s oldest university, Fes is an ancient city that still retains two old medinas. Travelers may want to begin their visit by walking through the Fes el Bali medina, where goods are transported by donkeys and handcarts. With a population of about 150,000 inhabitants, the medina is the largest carfree urban area in the world by population. Traditional adobe homes and courtyards ornamented with mosaic tiles line a maze of narrow streets and alleys filled with souqs and shops. Fes is also famous for dyed leather goods. Several places are limited to Muslims, but just viewing the striking exteriors makes the trip worthwhile. The High Atlas is a mountain range that runs from the coast of Morocco towards Alergia. The range includes Toubkal National Park, which contains the Morocco’s highest peak, Jbel Toubkal (4,160 meters/13,670 feet). The Berber village Imlil is a good place to start the climb of Toubkal. The tallest mountain range in North Africa, the High Atlas offers outdoor recreation opportunities year round, from snow sports in the winter to hiking in the summer. One of the best places to visit in Morocco is the Todra Gorge in the eastern part of the High Atlas, near the town of Tinerhir. Both the Todra and neighboring Dades rivers have carved out steep cliff-sided canyons through the mountains. The last 600 meters (2,000 feet) of the Todra gorge are the most spectacular. On the edge of the High Atlas Mountains is Aït-Benhaddou, a traditional Mud Brick city that has appeared in many movies including Lawrence of Arabia and Gladiator. Merzouga is a small village in southeastern Morocco not too far from the border with Algeria. It’s on the tourist route because of its proximity to Erg Chebbi, sand dunes created by winds that reach up to 150 meters (500 feet) high. Travelers looking for a unique experience might want to take an overnight camel ride through the wavy, deep reddish-orange dunes. Most group tours end up at a pre-setup camp at the base of some very large dunes, where the various tour operators have their Berber tents set up. Dinner will be cooked here, perhaps some music played, and visitors can frolic on the sand dunes under zillions of stars. 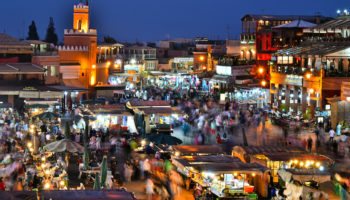 Formerly one of the country’s imperial cities, Marrakech is sometimes referred to as the Red City because of its sandstone buildings. During the 1960s, Marrakech was known as a “hippie mecca,” attracting famous celebrities such as The Beatles, Yves Saint Laurent and the Rolling Stones. 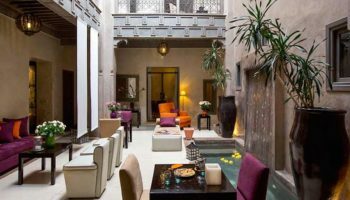 Comprised of beautiful old architecture and courtyards of orange, palm, apricot and olive trees, Marrakech today is still one of Africa’s most popular tourist destinations. The best way to sample its charms is to take off walking through the medina: watch a snake charmer, haggle over an old carpet, eat local delicacies such as sheep’s head or have a massage in a public bath. Other possibilities include strolling through the Jardin Majorelle, a botanical garden that blends art deco and Moorish features, and sipping mint tea at a traditional tea house. 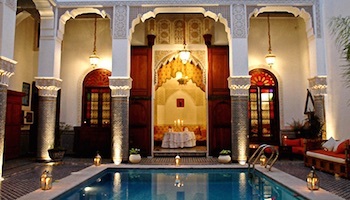 Which destination do you consider the best place to visit in Morocco? hi,this is one of the best pictures i have seen with lot of information.thanks. Great article on Morocco! We are planning to spend a week to 10 days touring the country in May 2015. Thanks for the great suggestions for places to visit. Loved the ranking… I am moroccan myself and still discovering the beauty of my fatherland. A ranking/rating that makes sense :). Thanks.